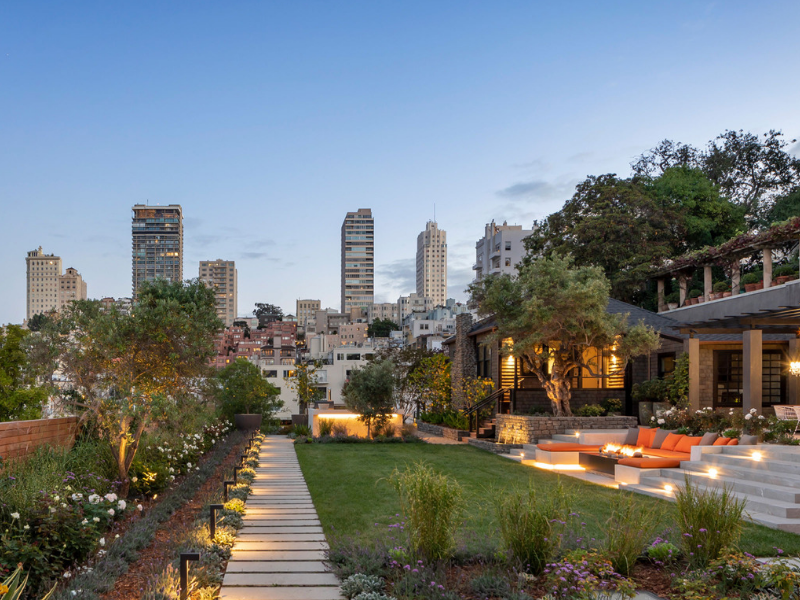 Sitting atop San Francisco’s Russian Hill, San Francisco’s most expensive listing is the best of both worlds — it’s a stone’s throw away from the hustle and bustle of the Financial District, and offers pristine views of the city’s most famous landmarks such as Alcatraz, Angel Island and the Bay Bridge. Yet its eco-friendly design that features a lavender and rose garden, lemon tree-lined slopes, a trellis outdoor dining area, infinity pool, and rainwater collection and filtration system will make any buyer feel like they’re at a faraway private retreat. Residence 950’s outdoor entertainment space. “It was essential for us to provide a home that is truly unique, has the most sought-after amenities and materials, and remains understated from the street and then reveals a rare level of amenity and openness,” he added. Malin bought the original structure, a shingled 1908 Willis Polk house in 2012 for $4.5 million, and doubled the estate’s size to what it is today. According to reports by Curbed and the San Francisco Chronicle, Malin knocked heads with San Francisco’s zoning authority after illegally demolishing part of the original structure. Instead of changing his plans, Malin, through his company Troon Pacific, agreed to pay a whopping $400,000 settlement, although he maintained he didn’t do anything wrong. The three-story home has three bedrooms, two guest rooms, and seven bathrooms, a Boffi-designed gourmet kitchen with appliances from Danish appliance maker Gaggenau, a formal dining and living room, a two-story art gallery that can also double as a private nightclub or entertainment space, and a four-car garage complete with integrated speakers and recessed LED lighting. 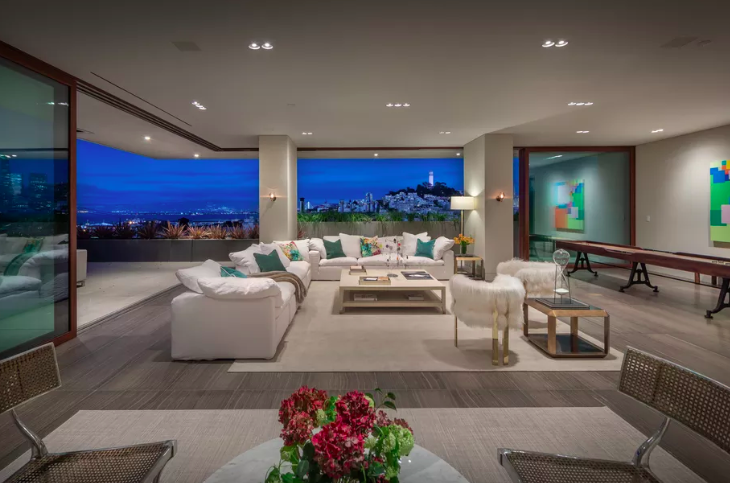 But, the home’s most dazzling feature according to Pacific Union International listing agent Val Steele is the outdoor living space that features a private theater with an all-weather retractable screen, a Hestan-designed outdoor kitchen with a rotisserie, wood-burning pizza oven and a bar. Lastly, lucky guests will be able to enjoy views from an infinity pool that overlooks Alcatraz and the Bay Bridge. A peek of the private wellness center. 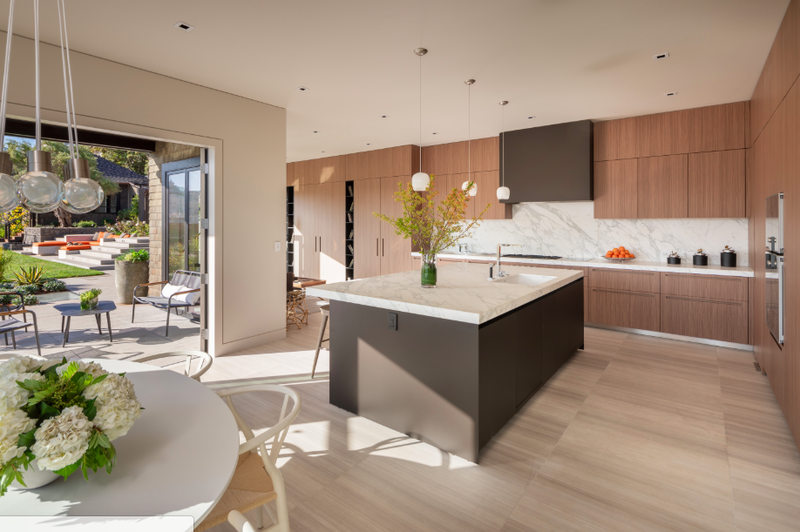 “Rather than bringing outside inside, 950 brings the inside outside,” Steele told Inman while noting the home’s pending LEED Platinum status for its environmentally sustainable and conscious design. The home is quietly being sold off-market, and Steele announced Residence 950’s arrival with a soiree that included panels from women CEOs, change-makers and social influencers, a full-course dinner, and tours of the main residence and the property’s one-bedroom, one-bathroom wellness cottage with a sauna, steam room, and hot tub from Troon Pacific CEO Gregory Malin. If you want a first-hand peek at Residence 950, you’ll have to wait — Steele says all tours of the home are appointment only. “All events will be strategically private and exclusive to protect potential new homeowners privacy,” she said.